One of the most creative of the current crop of sand carvers is Cleveland-based Carl Jara (above), who's been at it for 20 years. Three amazing Carl Jara creations are pictured here: 'Putting Down Roots' (center) and two Gold-Medal winners, 'Continuuum' (top) and 'Infinity' (above). And, more and more often, the creators of these structures are calling them art, with some proclaiming that the art of sand sculpture is hitting new peaks. "I have never seen an art form that people respond to so strongly," says Rademaker, who lives in the Santa Cruz hills and runs a firm called the Sand Guys with a partner. "When you're working sand, people crowd around. It's something that exists on the beach, where nothing can exist. It's a wild place." But just as the beach is a wild place, so too is beach art, which is largely if not entirely ignored by the mainstream world of fine art. 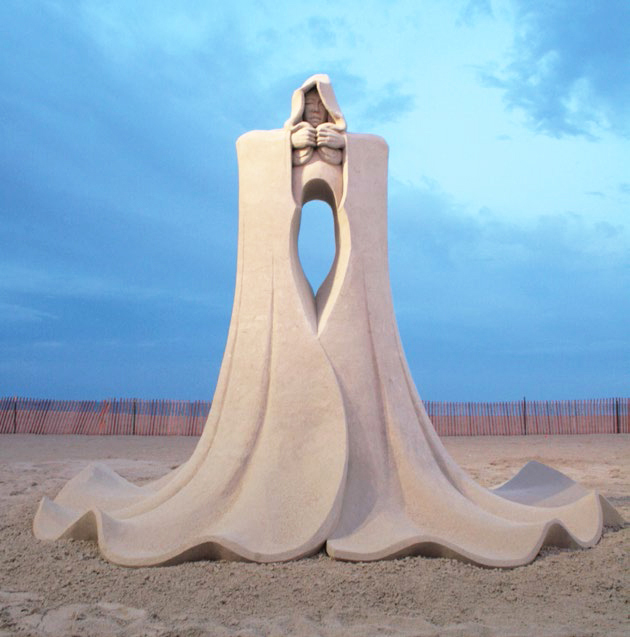 "It comes down to: is [sand sculpture] an art form or is it a craft?" Kirk says. 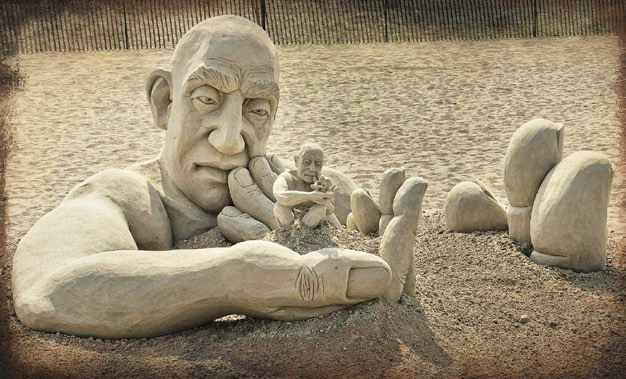 Much sand sculpture is art designed as commerce, which pushes it towards craft. Sand sculptors often adopt corporate speak, with Sand Guys bragging on its website about "creating innovative, ecologically sound advertising and promotional media for Blue Chip clients." "We work for some of the biggest corporations in the world, as well as provide sand sculpture tools and lessons for the neighborhood kids. Sand Guys International is based on California's Central Coast but works all over the world, from San Francisco to Thailand," the website goes on. Most sand firms are small, with one or two sculptors, and bring on friends when jobs require extra sand power. Rademaker says about 90 percent of the Sand Guys' work is corporate events or trade fairs, where the honchos most often have very defined ideas about subject matter and look. Many corporate events throughout the sand world are performances as well, with the sculptors creating during company retreats or team-building events. "Some people give you money just to make a piece of art," Rademaker says of commission work, but says the ten percent of his art that is more personal is created primarily at sand-carving competitions that take place worldwide. And that raises another question: "Is sand sculpting a sport?" 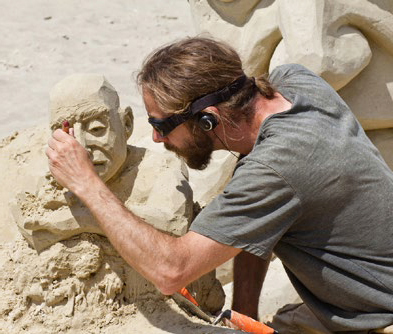 At sand competitions, where sculptors need to create a finished piece during set hours, generally over three days, strength, athleticism, strategy, and the ability to size up and account for sand conditions and weather are as important as design skill. "People don't want to come and see an exhibition. They want to see a contest," says Carl Jara, one of the most creative of the current crop of carvers, who lives in Cleveland and has been carving since 1997. It's during these competitions, though, that much true sand art is created. "When I'm doing contests, it's my time," Jara says. "It's an opportunity to really make something for me. It's a chance to express myself as an artist." 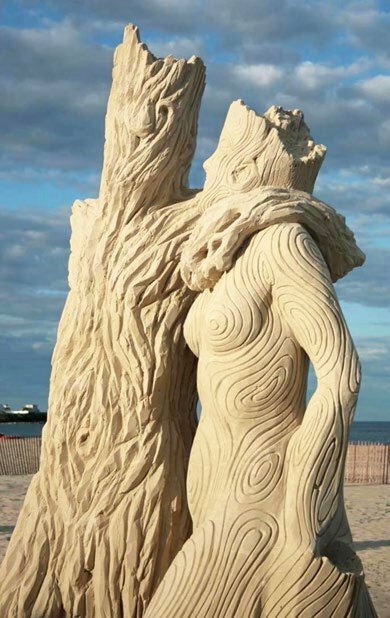 Dan Belcher, who became a professional sand carver in 1992, says, "Sand sculpture has progressed from competitions being more of a sport to being more of an artistic endeavor," as more time is allotted, "with more opportunity for solo contests, and more man hours going into the sculpture."